The device is suitable for breathing training and oral motor training and can be used in a therapeutic setting as well as at home. 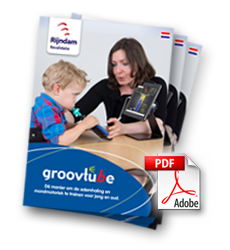 In rehabilitation institutes the GroovTube is used in respiratory therapy, speech therapy, occupational therapy and physiotherapy. In practice, the use of the GroovTube makes the patient aware of his respiration. Respiratory muscle training can result in maintaining better condition of the lungs, and a better cough in children with neuromuscular disease.